My interest in defensiveness began with a conflict with a colleague. We were having an emotional discussion about a subject that now escapes me. In the middle of the dialogue he said, “You’re being really defensive.” I very skillfully responded, “No, I’m not!” After an exchange of “Yes, you are” and “No, I’m not,” I managed to become more skillful, shifted to a place of curiosity, and asked him an open question: “What does ‘defensive’ mean to you?” (It was becoming clear to me that we did not see this interaction in the same way.) His response surprised me because it was quite different from my definition. He thought defensive people were “covering their butts” and “lying through their teeth.” I responded that I felt judged, blamed and falsely accused, so it made sense to me that I was merely protecting myself. The realization about how differently we viewed this very complex difference between denial and protection directed us both away from the emotional issue at hand. Our discussion became the thesis topic for my Masters degree. We left our conflict behind--it did not seem as important any more. I was excited about this discovery since I had seen versions of this conversation many times before in mediations where people abandoned the conflict issues and became distracted with defensive behaviors. It seemed to me that defensiveness was a key piece in resolving conflict. People get entangled or caught up in this emotional complexity where walls and barriers start to go up and communication becomes misunderstood. For most people, including myself, the most powerful sensation surrounding defensiveness is confusion and feeling misunderstood. My enthusiasm increased when I started a literature search and found that little has been written about defensive behaviors in conflict. My intention in this presentation paper is to draw together the underlying components of defensive behaviors for the benefit of those dealing with conflicts in the workplace. An important focus will be to explore ways to address defensiveness and to shift communication to a more constructive mode. The focus is not to determine if the parties are acting in denial or self-protection because interventions do not depend on our assessment of the rightness or wrongness of respective positions. The goal is to eliminate barriers to communication and increase understanding. What I will be sharing with you comes from a descriptive rather than a prescriptive approach based on two years of research of the literature, discussions with a focus group of conflict resolution practitioners, and in-depth interviews with conflict resolution practitioners. In defining defensiveness, Senge (1994) draws an analogy to medieval times when “alchemy was a symbol for transformation of what is most common (lead) into what is most precious (gold).” In conflict, parties “practice a special form of alchemy, the transformation of potentially divisive conflict and defensiveness into learning” (p. 257). While the alchemy of defensiveness is not about converting lead into gold, it is a useful analogy for thinking about transforming the heaviness and inertness of defensiveness into lightness and understanding. With defensive behaviours, it is more useful to dig for the gold to find the deeper need in the conflict. Avoiding the behaviour usually does not resolve the unmet need. In the field of conflict resolution, Bush and Folger (1994) use the word “transformation” to describe the process of resolving conflict. They state, “ In this transformative orientation, a conflict is first and foremost a potential occasion for growth in two critical and interrelated dimensions of human morality. The first dimension involves strengthening the self… [and the second is] reaching beyond the self to relate to others ” (81). Therefore, defensive behaviors can be a valuable clue or key to assist the person to explore and gain better understanding of what motivates their actions. Sigmund Freud first used the term defensiveness in psychoanalysis in 1894. He defined defensiveness as a behavior or defense against unbearable ideas. Freud and his daughter Anna generated a list of behaviors called “defense mechanisms” –which will be discussed in more detail below. While often considered to be outdated, Freud’s pioneering research has made an important contribution to how we think about defensiveness. This definition brings up the question of what is under threat or attack. When people feel judged or blamed for something they do not believe is accurate or true for them, their identity or self-esteem is challenged. Face-saving becomes the dominant interest of the party under attack. The communication shifts away from the issues in conflict to a secondary issue of the negotiation of that person’s “face”. “Face is the communicator’s claim to be seen as a certain kind of person” (Folger, Poole & Stutman, 1997, p. 127-8). Face-saving is closely linked to defensiveness because a defensive behavior is protecting one’s self-image with another person who is challenging how we see ourselves. Goffman (1968) defines face “as the positive social value a person effectively claims for himself by the line others assume he has taken during a particular contact” (p. 226). For Ting-Toomey (1988), “Face, in essence, is a projected image of one’s self in a relational situation” (p. 215). When a judgmental statement threatens a person’s perception of self and the two perceptions are incongruent, the defensive person may be inclined to justify, deny, attack, or rationalize. Another important distinction in the definition that people in the focus group wanted to address was the word “perceived”. They thought it did not matter whether the threat or attack was real or imagined. If a person perceives a threat, the response will usually be defensive. Making assumptions is also a factor in this framework and defensiveness can be seen as a preemptive strike based on an assumption that the defensive person is going to be attacked or feels unsafe in some way. People may assume they are being blamed or accused unfairly, even when they are not. It makes little difference when addressing the perception of threat to face. When people are attacked, they can often find it difficult to admit being defensive because they feel justified and therefore do not perceive themselves as being defensive. People seem to believe it is “righteous indignation” that promotes the act of defending their good name. Some people would define the behavior as self-protection, something they deem a necessary function. There may be a correlation between power imbalances and defensiveness. When people perceive that they are deficient in power, defensiveness may occur. This feeling of powerlessness may result when people feel they are not equal players, or have fewer resources in the conflict. The fear that their interests will not be met can motivate the feeling of defensiveness. People who are defensive often cannot empathize with or understand another point-of-view that is different from theirs. They can be unwilling to take in new information or learn about a new perspective. They are preoccupied with saving face. Passive Forms: crossed arms and/or legs (closed or shut down posture), rolling the eyes, shaking the head, frowning, flushed face, refusing to speak, fidgeting, turning away, looking away, pointing a finger, and walking away. Aggressive Forms: slamming doors, leaning forward and glaring, pounding a fist, throwing something. attacking back, denying, raising voice tone, interrupting, dominating, repeating, swearing and name-calling, arguing, justifying, and rationalizing. Fine notes that the cataloging of defensive behaviors has extended far beyond Freud’s original list to “include virtually any dynamic process in which there is anxiety and a way of warding off the anxiety” (p. 313). He sees this ever-growing list of defense mechanisms as a problem, since literally “anything can be used as a defense against something else” (p. 297). In his own analysis, Freud seems to suggest that it is not as important to name a defense mechanism as it is to understand that a defense constitutes a response to anything that the ego feels anxiety about. We can extend this same principle to the observation of behaviors: it is not so important that we name all the observable behaviors as to recognize that defensiveness is observable. S. Freud saw the purpose of the defense mechanisms as socially acceptable ways to transform negative instincts. Defense mechanisms such as repression, denial, projection, and regression are sophisticated psychological strategies for avoiding and distorting reality. Therefore, defensive behaviors are an indirect way of expressing these thoughts and feelings when people do not feel secure enough to expose their concerns. Defensiveness is often motivated by issues that are buried or repressed and can be linked to the past. When discussing the individualized psychological approach, John Locke needs to be mentioned. Most of Western society has been steeped in Locke’s perspective that informs the rules for social norms allowing individuals to perform acceptable and consistent behaviors and modes of reasoning. This philosophy, known as linear cause/effect thinking, is used to solve problems. An example of this theory would be: situation A causes situation B; therefore, A is responsible for causing B, or A may be blamed for causing B. People will question why B happens, and want to assign a cause. Becvar and Becvar (1988) describe the Lockean tradition as the view that “[r]eality is considered to be external to us, to exist outside our minds. Thus meaning comes from external experience and we are recipients: we recognize order rather than create it” (p. 4). This thinking often results in a victim mentality in which only one person is held responsible for the result or effect of a conflict. This form of thinking leads to the belief that there are absolute truths about reality: my reality is right and your reality is wrong if it differs from mine. This thinking sets the stage for conflict and in this conflict each person believes they were hit first. They see themselves as victims and are not to blame. They see their counterattack as righteous indignation. This assessment is usually misguided and it doesn’t work. Helping parties in conflict shift to a systems approach can move them away from a right/wrong thinking or blaming as a way of resolving a difference of opinion. A new way of looking at defensiveness arises from social interaction where people mutually influence one another; therefore, a person cannot feel defensive in isolation. This approach does not focus on the individual and individual problems. The focus shifts instead to relationships and relationship issues, and assigns responsibility to both parties for contributing to the conflict. There is an expectation that the interdependence between people creates an element of subjectivity about reality, which is non-causal. This results in equal, reciprocal involvement in the interaction. Instead of asking why something happens, people will ask what is happening. Becvar & Becvar (1988) outline this perspective when they claim that “subjects and objects…are all involved in each other’s destiny. Reality is not external to us but is created by us as we bring our own personal perceptions to bear on it and give meaning and order to it. We are proactive” (p. 11). Gibb’s communication research on defensive and supportive climates is used as a foundation for most theorists as a starting point to discuss defensive behaviors. More recently, Stamp, Vangelisti, & Daly (1992) expanded on Gibb’s theory about defensiveness in their research. They state that defensiveness is “related to: (1) a self perceived flaw which the individual refuses to admit, (2) sensitivity to that flaw, and (3) an attack by another person which (4) focuses on an area or issue that the attacker perceives as a flaw in the other” (p. 177). This perspective would be an example of mutual influence approach. From a conflict resolution perspective, practitioners are more likely to approach defensiveness with curiosity and probe to discover what is motivating the behavior. Since behaviors usually make sense to the people demonstrating them, it is useful to explore the behaviour to determine the underlying meanings. It is not important to determine whether the defensive behavior is an attempt to deny an error, or lie to protect oneself. Whether the person is guilty or falsely accused should not be the focus of the intervention. The truth is more likely to be disclosed if a climate of understanding is established. The intention is not to decide a right or wrong point-of-view but to illuminate what is underneath the defensive behavior. The possibility of resolution is greater when this information surfaces. It is not as important to know what motivated the behavior as it is to address the behavior. Defensiveness adds another issue to the process that needs to be negotiated. Exploring defensiveness allows parties to discover new information. Avoiding this issue can result in an obstacle to reaching a mutually acceptable solution. Defensiveness is normal in a conflict situation and it is better not to judge it because conflict breeds a quarrel-and-blame mentality. Therefore, labeling the behavior as defensive often provokes people to deny it. This could create a double defense mechanism: added to the original defensiveness is denial of the accusation about being defensive. When defensiveness occurs, it is important to assess the impact of the defensive behaviors. When the communication is impaired by the behavior--preventing constructive dialogue and better understanding from taking place—defensiveness needs to be addressed. A key point is that there is no “cookie cutter” approach to addressing defensive behavior because, if the context or content is changed, the behavior may have a different meaning. It is not necessary to understand the psychology of the behavior but more important to address the behavior with interventions that refocus the discussions. The goal is to enhance understanding for both parties to resolve conflict issues, or at least improve the relationship. 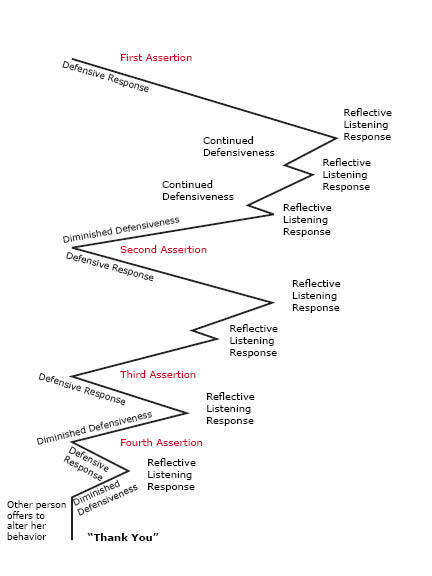 This diagram charts the pattern of defensiveness against a series of interventions alternating between reflective listening and assertion. (Adapted from a similar chart by Thomas Gordon, in Bolton,1979, p. 168). Interventions are introduced to illuminate the defensiveness so all parties recognize they have a choice in how they communicate with each other. People need to intervene when there are patterns of interaction that result in defensiveness. The ways chosen to intervene vary according to the type and goal of the conflict. Interventions differ depending on a person’s style and the intention for addressing the behaviors. Interventions are situational and many variables need to be considered. Caution must be exercised against the practice of merely applying interventions without sensing the appropriateness of the context. In the practice of conflict resolution it is understood that interventions are all useful at different times, in different ways, with different individuals. When addressing defensive behaviors it is important to not judge, label, scold, reprimand, ask parties to stop, make assumptions, increase their vulnerability, become negative, reassure, get angry, send a message that the defensiveness is inappropriate, corner them, or attack positions. If the defensive behaviors continue to impede the communication process even after different interventions had been tried, it may be necessary to disengage from the discussion. If the defensive behaviors appear to stem from a deep psychological problem, it is generally agreed to not continue the discussion. Most people are motivated by a desire to help people in times of conflict; they tend to see their role as one of facilitation and clarification, and of managing the emotional climate—of keeping the dispute resolution environment safe and supportive. This role seems to be best served with an approach that is reflective, curious, attentive, and flexible. Becvar, D. S. and Becvar, R. J. (1988). Family theory: A systemic integration. Boston: Allyn and Bacon, Inc.
Bolton, R. (1979). People skill: How to assert yourself, listen to others, and resolve conflicts. New Your: Simon & Schuster. Bush, R. A. and Folger, J. P. (1994). The promise of mediation: Responding to conflict through empowerment and recognition. San Francisco: Jossey-Bass Publishers. Fine, R. (1979). A history of psychoanalysis. New York: Columbia University Press. Folger, J. P., Poole, M. S. & Stutman, R. K. (1997). Working through conflict: Strategies for relationships, groups, and organizations. (3rd. Ed.). New York: Addison Westley. Gibb, J. R. (1961a). Defensive communication. The Journal of Communication, 11, no. 3, 141-148. Gibb, J. R. (1961b). Defense level and influence potential in small groups. In L. Petrullo, B. M. Bass (Eds. ), Leadership and interpersonal behavior (pp. 66-81) . New York: Holt, Rinehart and Winston, Inc.
Goffman, E. (1968) . On face-work: An analysis of ritual elements in social interaction. In W. G. Bennis, E. H. Schein, R. I. Steele, D. E. Berlew (Eds. ), Interpersonal dynamics, essays and readings on human interaction Rev. ed. (pp. 226-249) . Homewood, IL: Dorsey Press. Stamp, G. H., Vangelisti, A. L., & Daly, J. A. (1992). The creation of defensiveness in social interaction. Communication Quarterly, Vol. 40, No. 2, pp. 178-190. Ting-Toomey, S. (1988). Intercultural conflict styles: A face-negotiation theory. In Y. Kim & W. Gudykunst (Eds.) . Theories in intercultural communication (pp. 213-235). Newbury Park, CA: Sage Publisher. Is it about a defensive communicator (characterological)? Heron distinguished between chronic anxiety originating from the past and acute anxiety originating from the present. Chronic anxiety relates to issues or hurts from childhood that are denied for emotional survive. These issues relate to repressed distress from the past. Present issues are distorted by unresolved issues the past. Chronic anxiety can lead to maladaptive behaviors that block learning and growth. Behaviors can range from mild to extreme. In contrast to chronic anxiety from the past, acute anxiety is about normal or healthy anxieties that arise in the moment. Heron sees this type of anxiety as a motivator that can produce positive or constructive change. This type of anxiety can help people perform well. Acceptance/belonging can manifest as concerns about not being liked or wanted, or an anxiety of being rejected. “Here the person’s need to love and be loved is at risk” (p. 33). “Here the person’s need to understand and be understood is at risk” (p. 33). “Here the person’s need to act and choose, the need for mastery and personal power, is at risk” (p. 33). Behaviors resulting from chronic anxiety include submission, flight or attack. Submission can be passive or avoiding behavior with the person withdrawing or shutting down. Flight can include choosing to talk about other things, changing the topic, generalizing, compulsive questioning, rescuing another, and gossiping. Attacking can result in aggressive and confronting behavior by the person judging, blaming, challenging, resisting, competing, labeling, and stereotyping others. © 2002, 2007 Soules Consulting Ltd.